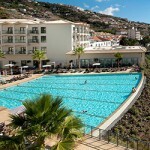 The Hotel Vila Galé Santa Cruz, Madeira, opened in 2006 and enjoys a privileged location over the sea in the picturesque village of Santa Cruz. 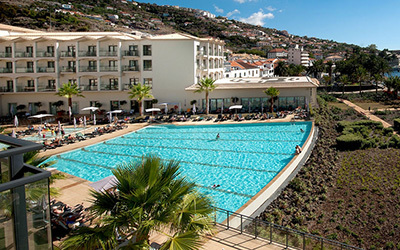 This modern hotel in Madeira has contemporary and welcoming rooms with a unique view of the Atlantic, 2 restaurants, 2 bars, outdoor pool and a spa with indoor pool, sauna, Turkish bath, gym and massage rooms. The hotel offers free Wi-Fi access in all areas and a large convention and meetings centre. During his stay in Madeira, be sure you take a full island tour to see first-hand the beauty of towering cliffs with breath-taking views, rolling hills covered with vegetation, banana plantations and vineyards suspended at the top of the hills, as well as typical and well preserved villages. 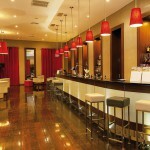 The hotel also provides free transport to the city centre, where you can stroll along its streets full of trade. If you enjoy golf, you may play at the Golf Club Santo da Serra, where while playing sports you will be contemplating a beautiful landscape. If you stay around Christmas and New Year time, make sure you also do not miss the show that is considered the greatest firework show in the world and that illuminates the entire bay. 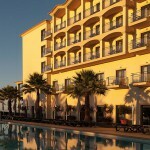 The Vila Galé Santa Cruz is composed by 262 rooms in its total. From these, we stand out 4 Junior Suites which are perfect for families.